Livestock in poor countries need drugs to stay alive and productive, but how to avoid the rise of ‘super bugs’? 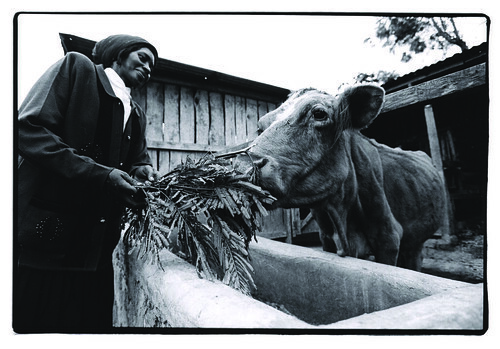 Woman feeds her milk cow in Embu, Kenya (photo credit: ILRI/Stevie Mann). Developing-country livestock keepers need more and better drugs to keep their animals alive and productive, and there are increasing numbers of livestock in the South, where there is increasing use of antimicrobial drugs, and poor livestock keepers will be hurt the most by development in pathogens of antimicrobial resistance. So what’s needed to avoid ‘super bugs’ arising? A new paper by scientists from Princeton University, the International Livestock Research Institute (ILRI), and other institutions, published last week in the Proceedings of the National Academy of Sciences and the first to asses global use of antimicrobials in the world’s food animals, has this to say. ‘Developing countries are pumping livestock full of antibiotics at such a startling rate that they are dramatically increasing the risk of creating drug-resistant “super bugs”, scientists warned on Monday.